Are you ready to POUNCE? One of the best tools to have on your bench is a pouncer to lightly dust tools and surfaces as a resist for things you DON'T want to stick. Use it by taping your tool onto the sock to coat the tip with powder, or pick up and tap on any surface to distribute a fine dusting of powder. If clay is sticking to your tools, this coating will minimize it. The benefit of using baking soda over other materials is that besides working better, it is easy to wash off with no left over stickiness from raw or baked clay. 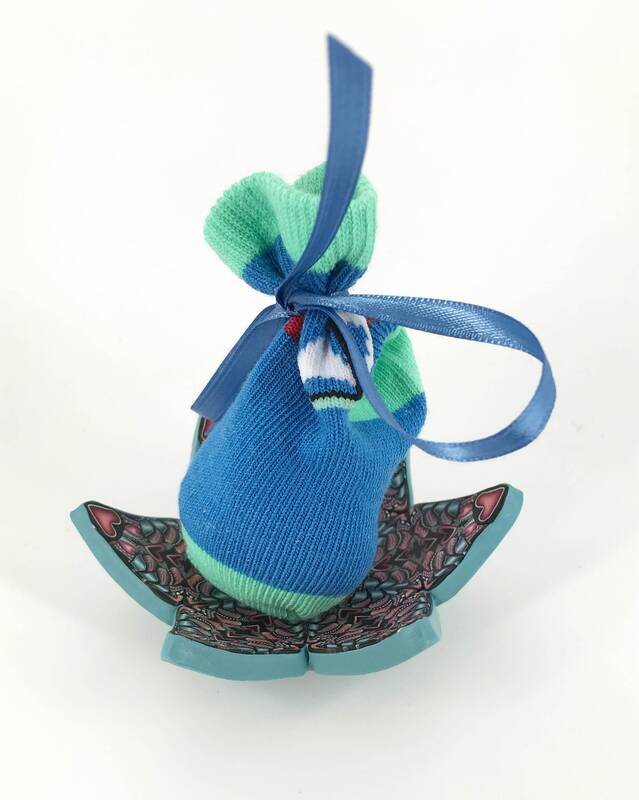 These cute little socks are filled with baking soda and tied closed with a nice ribbon (so you can open and refill when needed. Sure you can make your own, but why buy all the extra materials when you can have one already made up! To keep the powder from dusting everything on your bench and to keep it handy, store it in a sweet little handmade dish! Sized just right for the sock pouncer, the polymer clay dish is sturdy and colorfully designed with colorful canes in a one-of-a-kind creation. The little feet will keep it sitting upright, and also contain the stray powder. NOTE: To order the set, you will need to put each piece in your cart.